As 2016 comes to a close, I just wanted to take a moment to say thank you from the bottom of my heart. This has been such a wonderful year for Young at Heart and for senior pets in need! And it is all thanks to your love and support. In 2016, 118 senior pets were rescued, housed, and cared for by Young at Heart. WAIT... MAKE THAT 119 SENIOR PETS! Because today we rescued one more senior pet that needed help in 2016. 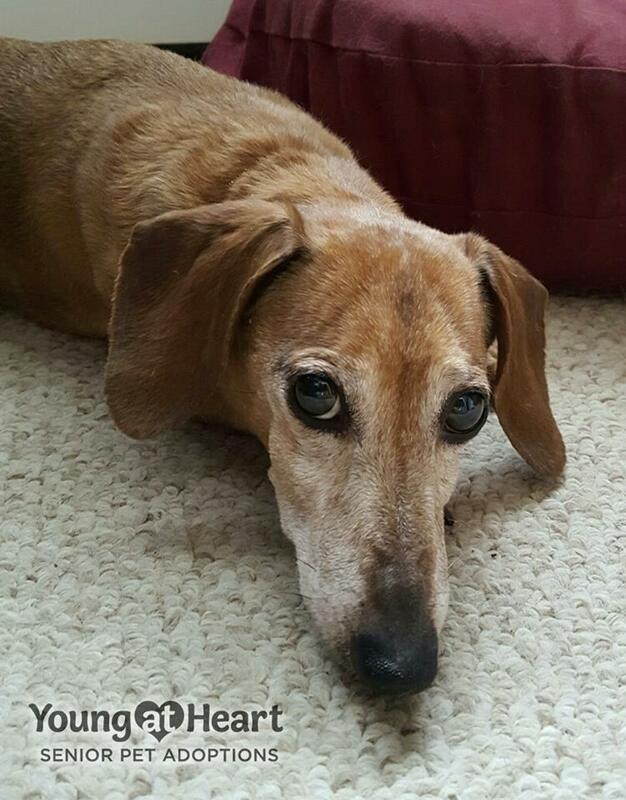 Meet Minnie, a very sweet 11-year-old dachshund. Now instead of being in a cage at animal control, Minnie will be ringing in the New Year and a new life with Young at Heart. She needs quite a bit of TLC - from rotting teeth to mammary tumors, she'll need a bit of veterinary care. But Minnie will get whatever she needs to get her ready for a loving home, and she will be showered with love and comfort from here on out. When you look into Minnie's eyes, hear her sigh with contentment as she snuggles into a fluffy bed, no longer in a cage at animal control, you can't help but want to help so many more like her that just need a second chance to live out their golden years surrounded by love and family. 2017 holds such amazing things for senior pets in need. As we look forward to finally breaking ground on our cageless adoption center and sanctuary for senior pets, we know we'll be able to save so many more lives. Being able to have a home away from home will allow us to help senior pets in so many more ways than we can now. But we'll need your help to save more lives. If you've been waiting until the last day of 2016 to be a part of making good things happen for homeless senior pets, there's still time to sneak in a donation (plus our Angel Donor will match it!). If you've already made a donation, thank you so very much for making it possible to help sweet seniors like Minnie. And to anyone who has helped Young at Heart this year - volunteers, foster homes, adopters, staff, veterinarians, groomers, sponsors and more - thank you! Because of everyone working together in 2016 for senior pets in need, 118 senior pets found love, safety, comfort and care at Young at Heart this year. We can't wait to do even more together next year! Thank you for being a part of this amazing journey. Together, we will do incredible things for the senior pets that need us in 2017. Wishing you much love, health, and happiness in 2017! LAST DAY FOR A 2016 TAX-DEDUCTIBLE DONATION! All donations will doubled until 11:59pm CST 12/31/16 or until $10,000 goal is reached. Prefer snail mail? Donate to Young at Heart, PO Box 1293 Palatine IL 60078. Have it postmarked by today 12/31/16 and our Angel Donor will match it!